The Sith are a species of red-skinned humanoids with tentacle "beards" that evolved on Korriban. Pure-blooded Sith are almost always left-handed, and thus their signature weapon, the lanvarok, is adapted purely for left-handed use. Though they engage in primitive practices such as sentient sacrifice, hold a strong caste system, and are in an almost constant state of war, their civilization was quite sophisticated; they see these acts not as cruel or barbaric, but simply basic aspects of existence. Their caste system includes a meek and lowly slave class, a skilled and intelligent engineer class, the priestly Kissai class, and the war-like Massassi class. Due to their history of association with dark side Force-users, the word 'Sith' went on to be used by many dark side organizations not connected with the original Sith species. The Sith species are a member of the Black Horde. Force Sensitive Feat: Force Sensitive Feat: Some beings are more sensitive to the living Force than others, allowing them to sense nearby Force-users and occasionally use the Force itself - even if they aren't trained in it. (DM's discretion). 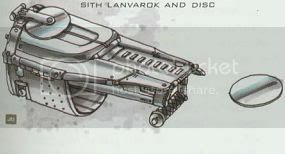 Sith Characters are able to start with their trademark, bladed-disc launching weapon the lanuarok (18-20 Crit, 3d4 DMG, 15 meter range). Sith with this item equipped can still use the hand its equipped in - just not in the same time as firing.